Assay Exact Gold Metal Composition to 0.01% in Just 2-5 Seconds! 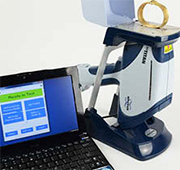 The Bruker handheld XRF gold assayer machine gets rid of the complexity, difficulty, and destructiveness of old-school gold assaying methods. It makes gold assaying a breeze. Today, there is no more need for fire assay, cupellation or nitic acid treatment. Please use the form to your right to get in touch with Bruker’s XRF gold assay experts, find out how out analyzers can easily solve demanding assaying needs, and to receive a quote based on the application that you require. A handheld XRF gold assayer could be just what you need to bring your business to the next level. Are you in the gold buying business as a middleman, collecting gold at your retail locations, gold parties, etc., or a bigger operation that collects and sorts a high volume of gold scrap inventory? Whatever your role, you can effectively become your own gold assayer with a Bruker S1 TITAN gold assay instrument. The Bruker S1 TITAN is the ideal tool for fast and accurate analysis of all gold alloy samples, including gold jewelry, gold scrap, gold teeth, gold bars, gold pins, etc. 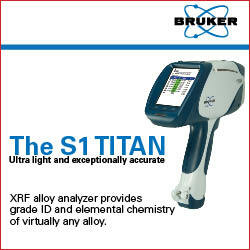 The exact percentage of ppm of gold in any sample—as well as the complete alloy chemistry and gold karat determination—can be identified within a matter of seconds using the Bruker S1 TITAN. With unparalleled accuracy, you can be sure that you have the right information regarding your gold composition every time. Perhaps the most important features of the Bruker S1 TITAN is that it is handheld, completely nondestructive, and cost-effective. The S1 TITAN therefore offers the utmost in flexibility, eliminating or reducing the need for destructive testing and long laboratory turnaround times, and providing near lab-quality testing in any location at all, from the retail counter to the docks to the refinery floor. Become your own gold assayer to upgrade your gold inventory while reducing costs. Contact Bruker technical analysis specialists to obtain information specific gold analysis needs and find out how to increase the profitability of your operation.